L3 Academy and Tinga Tanqueria team-up to offer unique children’s birthday parties. Millburn’s ever-popular, local eatery, Tinga Tanqueria, teams up with L3 Academy to offer LEGO® and engineering-focused birthday parties for children, ages 5 to 11. Millburn’s ever-popular, local eatery, Tinga Tanqueria, teams up with L3 Academy to offer LEGO® and engineering-focused birthday parties for children, ages 5 to 11. 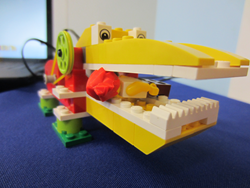 LEGO® Robotics: Party goers, ages 6 to 11, will enjoy building structures using gears, axles, connectors, wheels and racks before programming it to move, make sounds or respond to stimulus such as motion. Jr. Engineers: Filled with engineering challenges and a final challenge to build the fastest LEGO® racing car, our young engineers work with larger-sized gears, axles, connects and pulley systems. Bot Birthday Bash: Create and decorate your own mini “bot” before your child names and adopts the bot. What type of “bot” do you have? Where does “bot” live? L3 Academy is a seriously fun STEM learning center and unique birthday party provider. Entering its third year, L3 delivers hands-on experiences in science, technology, engineering, and math (STEM) through its birthday parties, classes and in-school enrichment programs. For more information, contact us at 973-783-8333 or Info(at)L3-Academy(dot)com.